If you are the type of person that has always had a passionate love for marine creatures and dolphins, then the Freeport Dolphin Trainer for a Day program might just be the experience you were looking for! This one of a kind, hands-on dolphin experience gives you a behind-the-scenes program that shows you everything that goes into being a professional dolphin trainer. If you have ever wondered what it is like to work at a facility that provides expert care to a resident group of bottlenose dolphins, then this is the tour for you! You will learn, from hands-on activities, all that goes into providing the best dolphin encounter programs anywhere in the Bahamas! You will immerse yourself in the world of the dolphins and their dolphin trainers, gaining an educational experience like never before! The Freeport Dolphin Trainer for a Day takes our Freeport dolphin programs to the next level. 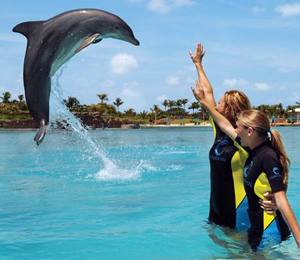 This goes far beyond our Dolphin Swim program and our Dolphin Encounter program, and allows a small number of curious guests to experience what it is like being a Bahamas dolphin trainer. You will help our trainers take care of the beautiful and friendly dolphins, and in the process you will learn all about their behavior and their habitat. This Freeport dolphin experience allows you to jump in the water alongside these dolphins and interact with them as one of their trainers would. The program is typically offered on Saturdays and Sundays, but if another day works best for you, we will try our best to accommodate you. We typically only take two assistant trainers for these programs, so we require advance reservations. If you loved dolphins before, we are confident that this Assistant Trainer program will increase your love and appreciation for these amazing sea creatures! I have been to the Bahamas many times, but Freeport Dolphin Trainer for a Day is one of my favorite trips! It includes everything that everyone should do here. As a Bahamas veteran, I can say only the best about this experience!